Fear of Hell is not a Catholic doctrine at all. Fear of Hell is ultimately a craven fear. Avoiding Hell is not even real goal. Fear of the Lord is the beginning of Wisdom, not fear of Hell. 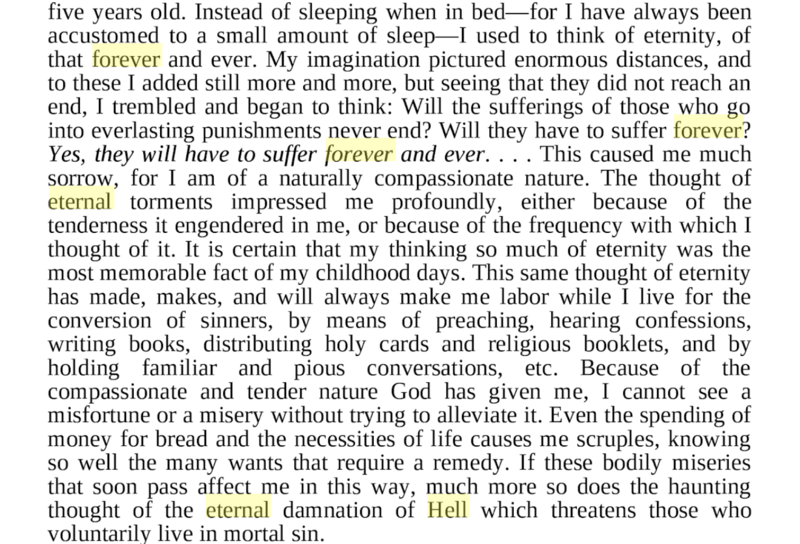 Even the better versions of the Act of Contrition have a fear of the loss of Heaven ahead of the pains of Hell. The more you love God and desire Heaven, the less you worry about Hell, it goes from fear to being wary and prudent to avoid it. You will ultimately drift towards what has your attention more. Just like you are likely to repeat a sin the more you focus on it, even though you are trying to avoid it. Focus on avoiding Hell too much and you miss Heaven entirely. If you instill an Hell-heavy attitude a natural response will be to ultimately deny the reality in order to escape the terror. This is because the children aren't taught properly about Hope and free will. The number of fallen away Catholics that scorn the fire and brimstone attitude is legion. I think a more sound principle is to never mention Hell without mentioning Heaven and judgment in passing. From my experience the "Four Last Things" was done away with long before the fear of Hell. Then the fear of Hell was dropped and the happy go lucky everyone gets to Heaven thing was introduced. Also a more practical reason for this "Holistic" approach is the simple fact that Catholics for some reason or another (maybe it's true of humans in general) can't seem to avoid gilding the lilly and making up stories and exaggerations. Some people seem to get an unholy rush of power at the thought of frightening children. Maybe a desire to pass on the fear they experienced. 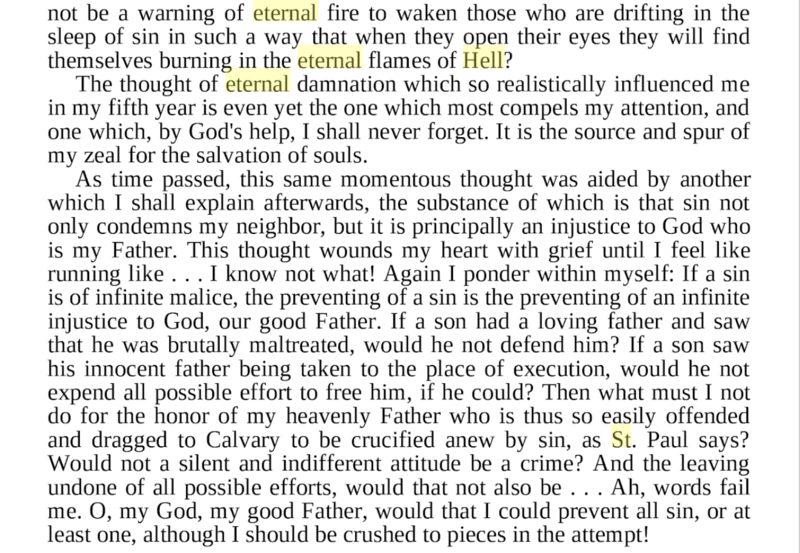 One of my favorite SSPX priests used to say, "Aim for Heaven, because if you aim for Purgatory, you're going end up in Hell." Of course you are right, sin does hurt man and I'm not opposed to talk about it - in fact, I believe it is very important to talk about it. However, you overlook the fact that fallen human nature is egoistic and not prone to thinking in long term. There are many sins which hurt man, but in longer perspective rather than immediately. Consider fornication - while it is sinful and hurts people in many ways (both spiritually - damaging ability to emotionally bond with another person, and physically - risk of STDs), it can nevertheless be pleasurable and many people can live many years experiencing genuine subjective happines derived from fornication - in such a state they are unlikely to look past immediate gratification, unless they become sorry for hurting God or start to fear hell. Arguments about hurting themselves are unlikely to reach them, because they have not yet experienced hurt from their sin and they think in short term perspective - such is human nature. Indeed, which is why there is a need for a balance between preaching about love and justice of God. Unfortunately, for the last 50 years justice was forgotten and love extended caricaturally beyond what the Church actually teaches, and we live the disastrous results. If love of God would stop Mortal sins then why are Mortal sins on such a high rate of increase? When people were taught to fear hell they are no where near as likely to commit Mortal sins at the rate they are being committed. The same is happening in society no fear of a just punishment leads to a higher crime rate. Fear of Hell is ultimately a craven fear. Avoiding Hell is not even real goal. "not a Catholic doctrine"? -- It's right from the lips of Jesus Christ. God hurt on the cross because of our sins. Find me an actual binding doctrine that says, "Instill the fear of Hell into your children." Do I really have to hunt down a series of verses in the Bible that explicitly state "I shall fear no evil" "Do not fear for I am with you.." or "Be not afraid.." etc..??? Teaching a child to fear punishment above all and not equally inculcate in them a love of justice and charity is not a teaching ordered towards a good end. It's ultimately a puritanical disaster waiting to happen. The proper type of "fear" is what needs to be taught so it is in conjunction with charity. Fear of Hell because of sheer fear of personal punishment is a far cry from fear of Hell because it is separation from God. He did it because He loves us and wants us to be with Him in Heaven. That is the "Good News" that He always referred to. "Find me an actual binding doctrine that says, "Instill the fear of Hell into your children." Where is the doctrine that says you must know X prayers or know answers to X questions to make your First Communion? You have to attend x number of moths of Religious ed to be confirmed? Maybe you didn't read up the thread. I said it wasn't a doctrine "to instill the fear of Hell into your children" Someone else stated that it was. I asked them to show me specifically. Re: Preparation for Communion and Confirmation, Those are policies and practices, they are not doctrines. Special needs people often do not need nor require extensive knowledge of the teachings on transubstantiation in order to receive communion. Confessions if possible with them are mere formalities to fulfill legal requirements since they don't often even know what offending means much less offending God. Eastern Catholics and Orthodox receive communion as part of their baptism rituals. I'm actually a bit amazed that I'm getting push back because I think deliberately emphasizing Hell to the detriment of the rest of the Four Last Things is shortchanging and damaging to the development of a healthy faith in children. Hell should not be emphasised over and above, or at the expense of, the other three of the Four Last Things, but in perfect confluence with them. In fact, they support and explain each other. Death doesn't make sense spiritually speaking unless it's a preparation for something greater: Judgement, which itself doesn't make sense without it having a consequence: Heaven or Hell. 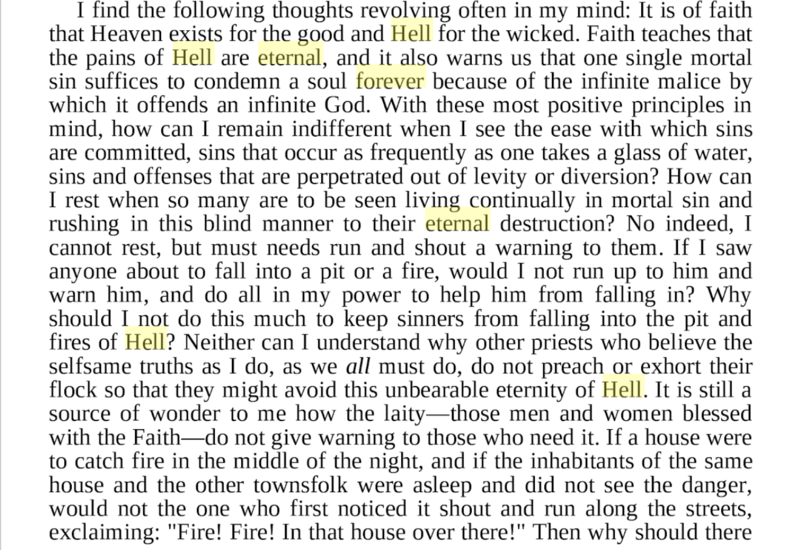 The Catholic teaching on heaven and hell confirms and expands the moral life and our natural understanding of good & evil - it teaches us that all our moral and immoral actions have a kind of cosmic and eternal importance, that our created free-will is an active component in the overall order of the universe, and not - contra materialism - a mere accident floating around a world of chance objects. The very existence of hell is in a sense a confirmation of our human nature and moral dignity because it affirms the weighty consequences of our crimes and proves their worthiness of punishment, which wouldn't be the case if we weren't guilty of corrupting something of quasi-infinite worth: the image of God in our souls. Children are nascent philosophers. They are always wondering the "why" of things. Explaining to them the existence of hell helps them to understand why their parents warn and punish them: it's to correct them and ultimately save them from hell. Otherwise they might expect that their parents were just being cruel and arbitrary. Children understand these kinds of things easily. They will accept it in good-humour as long as it's clear that you are motivated principally by love and not anger in telling them. The psychological problems people worry about in regards to teaching children about hell really only come from the parents being stingy and slow to forgive their children once they've said sorry and resolved to change, which leaves them feeling burdened with guilt and alienated from their parents and even from God. So the parents should bear in mind that they act in God's place over their children and that God expects them to be a good model. With this in mind the teaching of hell to children is perfectly good and healthy. Their guilt allows them to understand it intuitively, but their relative innocence as children prevents them from being overwhelmed with anxiety at the thought of it. The key thing to impress on their minds is that the sooner they start being good the easier it will be to avoid hell in the future and to go to heaven, and if hell doesn't seem like a real possibility now it will in the future. Lol, she'll never be a Protestant. At 5 years old, the fear of hell was the first step to sainthood in the life of St. Anthony Maria Claret, who was one of the greatest (but apparently least known relative to his greatness) saints of the 19th century, a bishop, preacher, miracle-worker, and defender of papal infallibility at Vatican I. You may want to tread carefully, there, Gerard. The Church decreed in Trent, "CANON VIII.-If any one saith, that the fear of hell,-whereby, by grieving for our sins, we flee unto the mercy of God, or refrain from sinning,-is a sin, or makes sinners worse; let him be anathema." That was in the sixth session, on justification and contrition. Sorrow for committing sin out of fear of hell is good, is supernatural attrition and can dispose us by degrees toward obtaining contrition for them, especially in the Sacrament of Penance. Ecc 12: "Let us all hear together the conclusion of the discourse. Fear God, and keep his commandments: for this is all man:"
It is good for children to have a healthy fear of never committing mortal sin, right from a young age. King St. Louis was taught like this, and he grew to become a great Saint and an outstanding king who performed many works of charity. If children are being directly catechized from a traditional catechism, the catechism itself will explain hell and purgatory, mortal and venial sins in the right place. If the articles of the Creed are being explained, the section "He descended into hell" is a good time to bring up Hell, Purgatory and Limbo. Servile fear must quickly become filial fear. And filial fear when it grows perfect becomes love of God for His own sake. This is the third and highest degree. St. Therese found the idea of doing good works solely out of love for God, in thanksgiving for so many great gifts of His, as a small means of returning Love so great that Jesus showed us, the most helpful and beneficial to her spiritual progress. Children progress at different speeds. Imho, fear of mortal sin is necessary right from the beginning. Once they are relatively secure of not committing great faults, and have come to the stage where they are seeking to love God more, then the promise of reward in heaven should be emphasized, usually the characteristic of the second stage of spiritual life. Only in the third stage of the interior life, in which St. Therese was, and that requires lot of growth in grace to reach, the primary impelling factor is the pure love of God. So fear of God and of going to hell through one's own self-chosen mortal sins is very important to teach children. We see Our Lady of Fatima showed the children a vision of hell, and they never forgot it and it led them to make very great sacrifices for sinners to prevent them going there. At the same time, She also promised them the reward of Heaven and to take them there, which they said was very consoling and a reminder of God's Love. And raised like this, the 3 holy children of Fatima grew up to become Saints, to have a filial fear and great love toward God, and very rarely sin. It is a bit of a strawman to characterize anyone's arguments as "teach your children about He'll or God's suffering and exclude the positive aspects". When your child looks at a crucifix and asks why Jesus is bleeding it is an appropriate time to tell him why and how his behavior related to it. No one is saying you can't also share God's love too. Is the topic teach your children about Hell or Instill the fear of Hell in Children? This is the difference between a physician coming in to teach your teens about reproduction and a showgirl coming in to turn your teens on. I'm thinking that this is such an ill defined area that people are making misapplications all over the place. People are conflating teaching about Hell with instilling fear of Hell with fear of the Lord, with imperfect contrition…etc. We are talking about the concept of deliberately provoking an emotional reaction in children. We aren't discussing the concept of Hell and its relation to us in a doctrinal manner in which each child or adult must make an evaluation based on their grasp of the subject and their will and not their emotional reactions. And children aren't stupid (not all of them anyway) and they will know on some level when they are being played. They aren't just learning about the fires of Hell, they are learning about manipulation through fear. This is why you see so many people scoff at "being damned to Hell" by "the Church" or the nuns or the "hypocritical" priests. This is why there is such schadenfreude over priests being prosecuted and in some cases persecuted over the homosexual/ pedophilia scandals rocking the Church.